Okay, so I have been hinting about this tutorial for about a week and so I am happy to say, that it is now posted! Introducing . . . Read With Me my newest Moda Bake Shop Tutorial !! To say I like this quilt would be a vast understatement. I absolutely love it and every time I see it I do a little happy dance!! This quilt was one of those fun experiences, where you start out with a basic idea, My idea, I wanted to do a "book quilt" because it had always been on my list of things to do, and when I saw Noteworthy by Sweetwater I knew they were the perfect prints to finally do a "book quilt in." So I drafted up a book shelf idea that looked a little like this. Cute, right. I was super excited with how it was coming along. But I wanted to add something to it that would really make it it's own and something that would just ooze adorable!! And that is where the appliqued "once upon a time . . ." came from. And can I just tell you, that when I got to this point, I was squealing with delight. I just love to see the idea in my head transformed into fabric, and when it comes out even cuter than I imagined, Bonus!! And then, there came the finishing touch, the quilting. I am over the moon excited about the quilting of this quilt. It so adds to the "once upon a time . . . " theme!! And, it was a whole lot easier than I thought it was going to be and so much fun!!! Some of you got pretty close to guessing the theme from the sneak peeks, great job!! The bean stalk on the right hand side was so much fun to quilt. Once again, I did the outline super dark and heavy, and then I just started with some swirls and leafs. They were so fun and freeing, I just kept swirling away!! And then the pink scrolls, love em!! They are seriously one of my favorite things to quilt! The final part of the quilting, and it is my favorite, is that each book has a title. For a family activity, each of the children got to pick their favorite stories . . . one they have read, and ones I have read to them and they were all written onto the books. I then added my favorites, my husband's favorites, and other family favorites. I quilted them in using a loopy cursive just using the machine the same way I would use a pencil. Which was a little hard in the center of the quilt as I am not the best at writing sideways, but I got through it. I decided to use a matching thread color because I didn't want bright shiny titles to take away from the overall theme of the quilt and I wanted it to be special for our family, in a quiet kind of way. And we all love it!! It has already become a treasured family favorite! Oh, you might want some of the nitty gritty :) The quilt measures 58" x 73", just the perfect size for snuggling up with your wee ones with a good story, or for a special one's twin size bed :) It is made using a Noteworthy jelly roll by Sweetwater and some Bella Solid white and black. It really is a fun quilt to put together and is very beginner friendly. We'll that just about wraps it up :) To view the entire step by step tutorial, just pop on over to the Moda Bake Shop and enjoy the Read With Me quilt tutorial!! :) I am sure that if you choose to make your own that it will become a treasure in your house, just as it has in ours. I will leave you with these adorable little cuties of mine!! Have a Happy Quilting day!!! I think this is a great way to make a memory with the kids. The quilting is so fun and creative, wonderful quilt! That is just sooooo very cute Melissa!! You did an awesome job with the pictures around the books. I love it. This is so beautiful! I love the quilting! Saw this on the Moda site and had to come over to your blog for more photos. Just a wonderful, wonder-filled quilt. What a great quilt! And the quilting is fabulous. I especially love the castle turret on the left side. This is great! I love it. Awesome job! The quilting on this makes it so extraordinary! I love it! Oh this is super cute!! You are so talented! The kids are growing up so fast. Great post! Love your explanations and pictures.So much fun to see it all come to life. love the whole thing, thanks for sharing great job!!! Fantastic. The quilting is stunning. The last photo is adorable. This quilt is beautiful! The quilting is so creative and perfect! I love the castle turret and the bean stalk on the sides! LOVE this! I've been planning on making a book quilt for my kids school librarian and my son's kindergarten class. (The kindergarteners are studying Q in a few weeks so we're going to let them each choose a fabric (pre-cut) to be "their" book in the wall hanging. Fantastic! I love your quilt, colours, pattern, books - beautiful and great idea! Amazing job! The quilting is genius! SO CUTE! I think I'll have to pin this one until my kids are old enough to have a few favorite books. Very nice job and thanks so much for the tutorial! It looks GREAT! The quilting is fantastic! I love this quilt! Super cute, I love all of the quilting detail, it really adds so much to the qulilt!! Oh, that is the cutest quilt ever! I loved it in the first photo. But, when I saw the quilted castle I was over the moon, too. All I can say is "WOW"! That is a great quilt, love what you did with it. Oh MY GOSH! This is so amazing! I love the books and the quilting is crazy-awesome! Great job!! I love how you titled each book. Oh my goodness, this is probably my favorite quilt you've ever made. Love it! I absolutely love your quilt! What a great idea! My daughter and I both love to read so I am definitely going to have to make one of these for each of us. 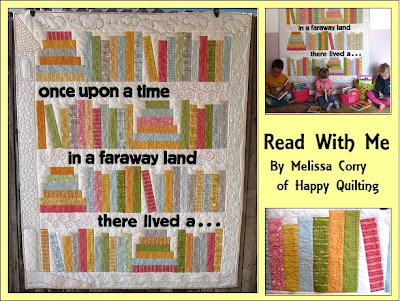 Your quilting is so amazing with the fairy tale theme and your idea of the book titles is beyond amazing. Melissa this is fantastic. I love all the details you put into it. especially the book titles from all your families fabovorites. Wow. Truly a treasured item. And I so agree with paper books being a kids friend. Yes! WOW! AMAZING!!! I've been trying to get my daughter into quilting and this just might be the key....she is a librarian that collects books and fabrics but never does anything with the fabric... Beautiful quilt!! What a fun idea, and the quilting is amazing! It is such an adorable quilt, Melissa! I love the idea of book titles quilted in there and the close-up shots are breath taking! The castle simply just left me speechless! Thanks so much for sharing! Wow! I love books, and my grandchildren do, too. I seriously am going to have make a couple of these, and maybe adapt it to book bags. Great job! It is a very fun quilt! I like that photo with your kiddos in front of it. Great quilting! Your quilt is so wonderful! I love every detail of it, you are so creative. Fun fabric collection that you used. I have a Noteworthy jellyroll and am really considering making this quilt, it looks so fun. Great job! Great quilt!!!! Going on my bucket list!!! Oh how I love this quilt! I have seen something similar before. I want to heartily thank you. I love jelly roll quilts and I look forward to making this. Now my goal is to get this jelly roll. Again thank you. Oh, how amazing. Am I the only one trying to identify all the books? I love your quilt Melissa. It's gorgeous. I love this... well done! They are adorable :) love the quilt too! The quilting design is amazing--it makes the cute quilt into something wonderful! Adorable quilt pattern. Incredible quilting! I make quilts for my kids' teachers each year. This is sure to be a favorite! Thank you for rescuing me from something I didn't absolutely love with this design! I am making 2!!! Awesome, awesome, awesome!!! This is the best bookshelf quilt ever. Love the pattern, love the fabrics you chose and all the little details that make it special. I might just have to make one. I simply adore your read with me quilt. I think this is the most clever quilt! I love it so much! lets do this at quilt walk festival next year! love it. You did a wonderful job on your book quilt! I've added this to my list of things to do eventually! This would be a beautiful quilt to make for a donation to our local library. They have a great children's department! That is seriously the cutest thing I have ever seen!! Great job!!! SEW Cute! I missed this being gone to the Block Party! I want to make one now. Thanks for the Tutorial. I have a "Reunion" Jelly roll that would work for this. Oh my, this is so incredibly adorable! Thank you SO much for sharing the tutorial on how to make it. I'm currently working on my first ever quilt (Lori's Bee in my Bonnet row-along). This book quilt is definitely now on my short-list of quilts to make. Here's a post with my quilt that is loosely based on yours...I mostly used the same measurements and made it up as I went along. Amazing quilt! I'm thinking it would be lovely in my daughter's second grade class room.